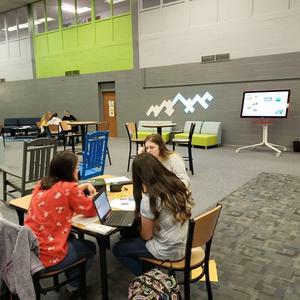 Our MHS Innovation Arena (formerly the Media Center/Library) was invited to virtually participate through live-streaming in North Carolina's Digital Legislative Day on April 3rd. This event showcased to NC legislators the support, need, and importance of modern, tech-enhanced, engaging spaces for students that promote creating, collaboration, communication, and critical thinking, in addition to books. Mr. Wiseman, who is our Innovation and Digital Learning Coordinator, stated: "This culture of innovative attitudes and meaningful, engaging activities and more are what we will continue to promote, model, and encourage in the Innovation Arena. Thanks again to participating teachers who have stepped out of their comfort zones to try new things and for allowing students opportunities to learn, collaborate, and create outside the 4 walls of their respective classrooms. This vision is what your Innovation Arena has been designed for. We are no longer the Media Center of the PAST!" We're #titanproud of the opportunities available to our students through these spaces!